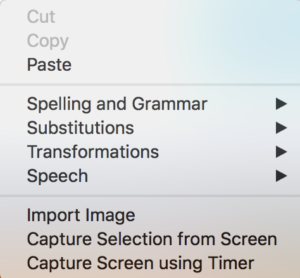 Select the Capture option and you’ll find Grab lets you take a screenshot of a portion of the screen, the Window, Screen, timed screen or even the timed Touch Bar (on a MacBook Pro with Touch Bar). It’s possible you’ve come across this before, but may have missed the lower three items, which let you Import Image, Capture Selection from Screen, or Capture Screen Using Timer. Use this option to import an image from a connected camera or scanner. This is a neat way to share a scanned invoice if you’re using Business Chat to speak to customer support, for example. (The implementation seems a little limited. I’d like it to be able to source images from Photos and the Desktop, for example). Tap this option and you’ll be told that the Mac will capture an image of an area you select on screen. Just pop your cursor to the top left of the area you want to capture, click and drag to create a red square that shows you what you’ve selected. The image is subsequently created when you let go. This option is useful if you don’t want to capture everything you happen to see on screen in the image you share, it lets you set a time (10-seconds) during which you can click on the application you want to capture an image of, type Command + Option + Hto hide all the other open apps you have on your Mac, and the image will be taken. (In practise. I’ve found the Messages app usually remains visible for some reason). 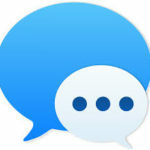 In all three cases, the image captured from within Messages will be popped neatly into the Message thread, enabling you to share it immediately with whoever you are chatting with. My Messages only shows Import Image ??? The first question has to be: What version of MacOS are you running, and on what Mac? That’s the set-up I use — so I do not know why yours is not working as mine. I can’t (yet) identify a way to replicate it here. Previous story Mac users: Do you know this three finger drag trackpad tip?